Nike Missile sign. Photo courtesy of David Bangs, 2001. Now an open field, “Radar Park” was once a military installation used to protect our area from air attack. All that is left of the installation now is sidewalks (which seem to serve no purpose), cement pads, landscaping features and an interpretive sign. 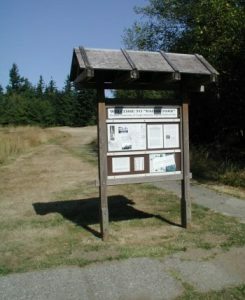 The site is part of the Cougar Mountain Regional Wildland Park, at the very top of Cougar Mountain. Amenities include restrooms, picnic tables, a playfield, wildlife interpretive signs, and access to a great trail system. To reach Anti-Aircraft Peak: From I-90, take exit 13 and drive up Lakemont Boulevard. Turn left onto Cougar Mountain Way, then right onto Cougar Mountain Drive, which will become the park’s gravel driveway at the very top of the mountain. You are standing on the sidewalk of a former military base put here to defend Puget Sound from air attack. In 1953, this site was occupied by anti-aircraft guns. Then, from 1957 to 1967, it served as the “radar” portion of a Nike Missile Defense System. (Hence the names, “radar park”, and “anti-aircraft peak”). When more advanced missiles and jets made the Nike System obsolete, King County acquired the grounds for a park. This 17 acre site was the first “cornerstone” of what is now a 3,000+ acre regional park. The large meadow in front of you was originally created for a ring of 90mm “Skymaster” anti-aircraft guns, and rubber-skinned “Butler Buildings” for the troops. Puget Sound was a center of commerce and population, and also home to important shipyards and aircraft industries, making it a strategic target. With the development of long range bombers there was a real need to protect this area, and the guns were the best thing available. The two photographs at left were provided by Peter Watrey, who was sent here as a raw recruit. (Perhaps as a security measure, most of the enlisted men came from east coast cities like New York, and had never seen the northwest before. Peter says that apart from the secrecy and the boring guard duty, it was “like being stationed in heaven”). The “Cold War”, which followed Word War II, was dominated by fears of a surprise attack by high speed bombers, and this led the army to seek a new king of air defense system. The problem was that planes were becoming so maneuverable, and flying so high and fast, that the ground based guns could not keep up. The solution called for a supersonic missile which could be controlled from take-off to target by radar. In 1945, the Bell Telephone Laboratories were recruited for the design/development job because of their extensive prior work with radar and computers. Douglas Aircraft, Western Electric and hundreds of subcontractors labored for the next eight years to produce the missiles and construct the total system. Each Nike installation consisted of two separate areas: A radar control site, (where you are now standing – “radar park”): and a launch site where the missiles were actually kept. (Cougar Mountain’s launch site is nearly a mile downhill to the southeast on 166th Way S.E. It is known as the “Nike Missile Site” on the park maps, and will eventually have its own parking lots and interpretive signs). The Nike system required three separate radars all interlinked by a central computer. First was the Acquisition Radar which located enemy aircraft at long distance. Next was the Target Tracking Radar which locked-on to the attacker, despite any evasive maneuvers. Last was the Missile Tracking Radar, used to alter the course of the missile in flight and direct it to the attacker. (Our present day personal computers are said to have evolved directly from the interlink and control computers first made for missile systems like this). The adjacent map will help you locate the radar pads and other “Nike” remnants. The large hill to your left is actually a man-made structure atop which an antenna tower was mounted. (Look for mysterious cement pads and a picnic table there today). Other concrete pads to the west of the antenna-mound are where Quonset Huts were located for living and working quarters. (It took 125 men to staff the radar and launch sites on a day and night year-round schedule). “Safe” housing for military families was located down the mountain to the north near 164th Ave. S.E. and S.E. 46th Street. The new radio tower near the cement radar pads at the top of the park is still run by the Army Corps of Engineers, but it is shared with the State Department of Transportation and services primarily peaceful purposes now. Site SF-88 – Last Remaining Nike Missile Site – Contains pictures and videos.